Do you wear your emotions on your sleeve? Well, with Vanessa Sorenson's Tweet Sleeve, you can do that a bit more literally. 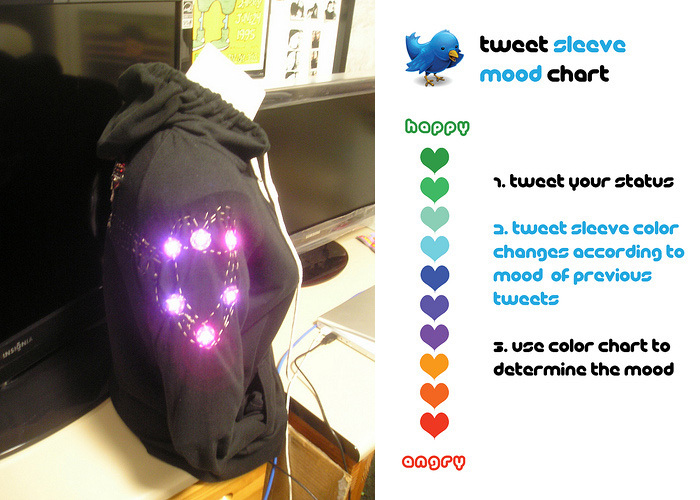 This gadget searches for keywords in your most recent tweets to gauge your mood and then displays that mood on the sleeve of a hoodie. I think it's awesome. Being the artist of it and all. haha. I already have something like that. It's from the birthday suit line, and it's called a face! Unfortunately , this accessory is not compatible for those who have recently purchased from the botox collection. "Tweet Sleeve: Wear Your Emotions on Your Sleeve"